I really love how this turned out! I’m not a pastelist but I sure love it. The richness of color, the smoothness of the values — beautifully done, Ronnell — truly outstanding work! 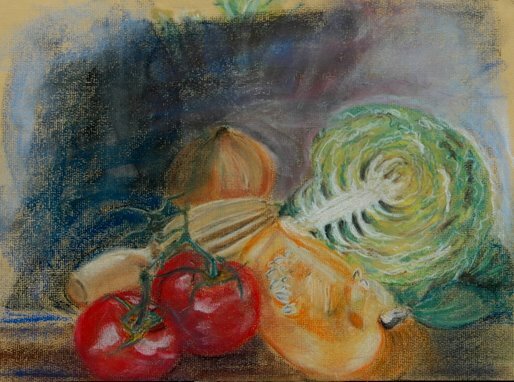 I really love your still life, Ronell it’s instantly, absolutely you and shows a great rapport with soft pastel. Pastels of all types HATE me. I keep going back to them hoping a miracle will happen and I’ll finally get it but I don’t. Pastel pencils, IN PARTICULAR, HATE ME! You’ve captured the pose wonderfully. I wait with you for higher powers to crack the Pastel Pencil Code. ouch! This is me today!!! We (the family) needed a fun day and so we invited everyone over for a pool party. I was left out to bake a bit too long! LOL! I think this piece very expressive. If you were striving for that this is it! I have just begun to feel like I am getting the hang of conte crayon. A bit harder than pastel but approaching it slower and building up a drawing in comparison to laying of color boldly. I also like this piece very much. I will caution you that our teacher didn’t let us smear white or lay it over black or sanguine because it deadens it (the white). She made us plan our lightest lights and darkest darks! I love the tomatoes in your veggie sketch! Those veggies are gorgeous – love the lively linework in the cabbage and pumpkin… I think if you brought some of that into the figure study it would be fantastic – it is a lovely pose. I’m not a pastellist though – get squeamish with the feel and the sound of them, but these make me think I must get out my almost untouched box and give it a go again! Hi Ronell……I have never tried pastels in any form so I can’t help as far as technical stuff goes but I can say that I really do like how this turned out…..I get a strong, dramatic feeling from it. Previous Previous post: The story of Vivien, published by Ronell.